I want some genuine Epson WorkForce WF7015 ink and your website comes up with different numbers. Is this correct please? I've recently ordered cartridges off you and want to check that they will work in the WF7515? The ones you sent me are: CSEPS1301 (B); CSEPS1302 (C); CSEPS1303 (M); CSEPS1304 (Y). Thanks, Steve. We can confirm that you've received the correct cartridges for your Epson WF-7515 printer. The references you've quoted relate to compatible cartridges for the WF-7515 printer and part of this reference number will be found in the OEM manufacturer code. For example, "CSEPS" is irrelevant but "1301" indicates that this is the compatible Epson T1301 cartridge etc. A small business that requires more than just a printer can consider the Epson Workforce WF-7515, the multifunction version of the Workforce WF-7015. This midrange device comes with a fax machine, scanner, and a copier to ensure high productivity and savings, but it is heavy and quite bulky for a desktop. The most notable aspects in the design of the Epson Workforce WF-7515 are the sleek frame and the busy control panel with a 6.3cm colour LCD screen. The Epson WF-7515 is ENERGY STAR-qualified, supports up to 250 sheets of paper, has a single paper tray, and can print on A3 media. Additionally, there is a USB port in front for PictBridge and USB flash drives, but users can also print from a Wi-Fi or Ethernet-based network. There is a 33.6kbps fax machine and an A3 flatbed CIS colour scanner that acts as a copier, too. The Workforce WF-7515 prints with Epson Micro Piezo print heads with 4 colours integrated as part of the DURABrite Ultra ink system. Print speeds are decent with the Workforce WF7515 for business-quality A4 documents, ranging from 8.4ppm in colour to 15ppm in monochrome. The scanner and copier are user-friendly, and the latter can function without a PC. The fax modem is speedy, and the device itself is compatible with PC fax. 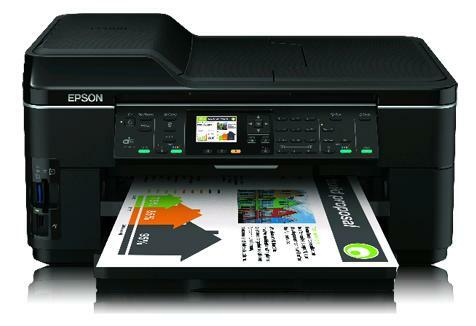 The Epson Workforce WF7515 is also praised for the Epson Connect feature, which adds to the wireless and direct printing features of the device. The Epson Workforce WF-7515 comes with an automatic document feeder for any type of media until A3. Size is among the setbacks of the Epson Workforce WF-7515 because it measures approximately 22 inches wide and 16 inches deep. Without the ink cartridges and the power cable, the entire device is already heavy at 15.6kg. The Epson Workforce WF-7515 could be more efficient by supporting more memory cards and accommodating a Bluetooth adapter.